This data set contains a single comma separated text file which reports diameter at breast height (DBH) measurements in the old-growth upland forest at the Pará Western (Santarém) - km 67, Primary Forest Tower Site. This site is in the Tapajos National Forest located in north central Brazil. Measurements were made periodically from July 1999 through August 2005. Trees with DBH >35cm were measured for ~2600 trees in four 5ha transects. Trees >10cm were measured in a smaller area (Rice et al., 2004). Measurements were made in 1999, 2001, and 2005. Trees are identified by local common names. A cross reference to scientific names is provided as a companion file. Coarse woody debris and litter samples and measurements were collected same area. See related data sets. 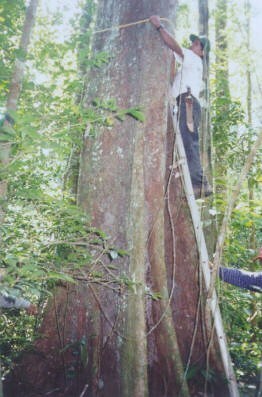 Figure 1.In July of 1999, trees were surveyed in 20 ha of forest in the tower "footprint." Over 2500 trees were measured, identified and mapped in four transects (1000m) east of the tower. Tree DBH was measured at 1.3 meters unless a buttress was present, in which case the DBH was measured just above the buttress. Repeated DBH (diameter at breast height) measurements of live trees in 4 transects in the foot print of an eddy flux tower. tag = Initial tag number. Stays the same unless tag falls off, disappears, or is out grown. new_tag = If tree loses tag, and gets retagged, then new tag number appears in this column. Otherwise appears as an NA. volume.cm3 = volume calculated from measured dimensions. x = distance along the x-axis. This is the long, 1000m axis. y = distance on y axis, or centerline, positive is towards the north, negative towards the south for Ts 1-3; for T4, positive is to the west and negative to the east. band = a logical flag, where 1 indicates tree also had dendrometer. dbh_99 = dbh measurements in 1999, in cm, note an NA is entered for trees that are recruited later. dbh_01 = dbh measurements in 2001, in cm, NA could also be tree that died. dbh_05 = dbh measurements in 2005, in cm, NA could also be tree that died. canopy_05 = an indicator of canopy status in 2005 survey, where 1=emergent, 2= canopy, 3=subcanopy, 4= understory/suppressed. dead_05 = logical flag, where 1 = trees that were previously alive, but dead in 2005.
dead_01 = logical flag, where 1 = trees that were previously alive, but dead in 2001.
yr_rec = logical column for what year tree was recruited. wood_dens = wood density assigned from Chave et al. (2006) supplement compilation of wood densities. The data set covers the period 1999/07/10 to 2005/08/31. Temporal Resolution: One measurement in 2001. Included as companion files are files of the common names as reported in the DBH data file cross referenced with scientific names. Abarema mataybifolia,"tento folha miuda, tento preto"
Used to estimate total standing live biomass in forest, as well as fluxes in live biomass and compare to eddy-flux tower observations. Data have been proofed and corrected where necessary. Problems with these types of measurements can include instances where trees appear to grow or shrink an impossible amount; a difference likely due to transcription error in the field. This data set has been screened for such errors and they have been filled with mean values of similar trees. Contact author for more information on corrections. Working with Brazilian forester, Edna Gomes Tenório Guimarães, we installed four permanent transects, 50m by 1000m, adjacent to the eddy-covariance tower site. Three radial transects originate at the tower and run 1000m in the three predominant wind directions, northeast, east, and southeast. The fourth runs north-south, situated in the main footprint of the tower, intersecting the east-west transect about 300 m upwind. To permanently mark the area, stakes (PVC pipe) were installed every 50m to mark distance along the central transect line. All live trees were measured in 4 x 50m by 1000m transects in the footprint of an eddy-flux tower. All trees with diameter at breast height (DBH) greater than 35cm were measured, tagged, and mapped on an X-Y coordinate system. Tree DBH was measured at 1.3 meters unless a buttress was present, in which case the DBH was measured just above the buttress. Small trees with DBH greater than 10cm were sub-sampled in a 10 x 1000m transect along the center line of the larger transect. Smaller trees (between 10 and 35 cm DBH) were also identified, tagged and measured in a narrower swath, 5 m on either side of the central transect line. We used the smaller survey area for small trees due to the large number of stems in that size class. 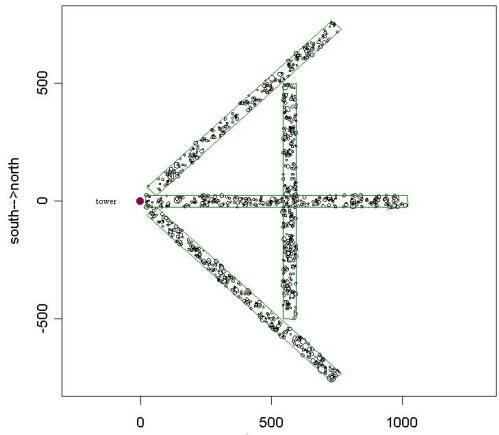 Estimates of x-y coordinates for each tree stem were recorded in terms of the distances along (x) and perpendicular to (y) each transect line. Mateiros from EMBRAPA, Erly Pedroso, and Nilson de Souza Carvalho identified trees by common name. Two student interns, Jorge José Pinheiro Macêdo, and Ocidne Franck A. Magalhães, were trained in basic forest mensuration techniques and data assembly and provided field assistance. In a subsequent visit in the fall of 1999, Nelson Rosa of the Museo Gueldi, Belèm collected specimens and provided botanical identifications. Jérôme Chave, Helene C. Muller-Landau, Timothy R. Baker, Tomás A. Easdale, Hans ter Steege, and Campbell O. Webb. 2006. REGIONAL AND PHYLOGENETIC VARIATION OF WOOD DENSITY ACROSS 2456 NEOTROPICAL TREE SPECIES. Ecological Applications 16(6):2356–2367. Rice, A.H., E.H. Pyle, S.R. Saleska, L. Hutyra, M. Palace, M. Keller, P.B. de Camargo, K. Portilho, D.F. Marques, and S.C. WOFSY. 2004. Carbon balance and vegetation dynamics in an old-growth Amazonian forest. Ecological Applications, Vol. 14, No. 4, pp. S55. Rice, A.H., E.H. Pyle, S.R. Saleska, L. Hutyra, M. Palace, M. Keller, P.B. de Camargo, K. Portilho, D.F. Marques, and S.C. WOFSY. (2004) Carbon balance and vegetation dynamics in an old-growth Amazonian forest. Ecological Applications, Vol. 14, No. 4, pp. S55. Vieira, S., P.B. de Camargo, D. Selhorst, R. Da Silva, L. Hutyra, J.Q. Chambers, I.F. Brown, N. Higuchi, J. dos Santos, S.C. Wofsy, S.E. Trumbore, and L.A. Martinelli. (2004) Forest structure and carbondynamics in Amazonian tropical rain forests. Oecologia 140(3):468-479. Saleska, S.R., S.D. Miller, D.M. Matross, M.L. Goulden, S.C. Wofsy, H.R. da Rocha, P.B. de Camargo, P. Crill, B.C. Daube, H.C. de Freitas, L. Hutyra, M. Keller, V. Kirchhoff, M. Menton, J.W. Munger, E.H. Pyle, A.H. Rice, and H. Silva. (2003) Carbon in amazon forests: Unexpected seasonal fluxes and disturbance-induced losses. Science 302(5650):1554-1557.